SOLO REAL FRUITS & BEVERAGES PVT. LTD.
Name SOLO REAL FRUITS & BEVERAGES PVT. LTD.
History Solo Real Fruits & Beverages Pvt. Ltd. had started up its first branch in India. As the leading soft drink manufacturers and distributors in India, we are popular for exporting carbonate and non carbonated health drink. Our health drinks are well packed in aluminium cans and PET bottles. Being a successful soft drink distributor, we are ISO 9001; ISO 22000 and HACCP certified and is located Rajkot City in Gujarat State. 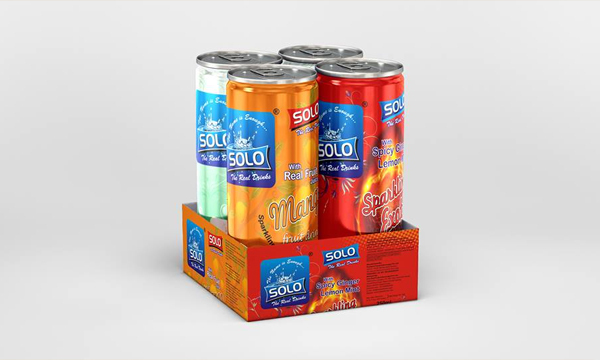 Solo Mango Fruit Drink 250ml. Solo Spicy Lemon Ginger Mint 250ml. Solo Guava Fruit Drink 250ml. Solo Yepi Mango Fruit Drink 160ml. Solo Jeera Fruit Drink 300ml. Contact SOLO REAL FRUITS & BEVERAGES PVT. LTD. Address Tilak Commercial Complex, Opp. Land Mark Honda, Gondal Road Circle, Rajkot-Gondal Highway, Rajkot.- 360004, Gujarat. INDIA.